Exfoliative dermatitis, also known as exfoliative erythroderma, begins as a rapidly developing, generalized redness of the skin surface. Fine scales or thick sheets of desquamation follow the erythrodermic stage. Pruritus (itching) may be severe. Hair loss and nail abnormalities may accompany exfoliation. Widespread lymph node enlargement, hepatosplenomegaly, and low-grade fever are common. Because heat is radiated away from the erythematous (vasodilated) skin surface, chills are typical, and life-threatening hypothermia may follow. The diversion of substantial blood flow to the skin may result in cardiac failure. The loss of a normal epidermal skin barrier may lead to septicemia, and the usual degree of debility that accompanies this disease predisposes the patient to pneumonia and other infections. You can view exfoliative dermatitis as the end stage result of chronic inflammatory skin disease and a completely damaged skin barrier. Exfoliative dermatitis is usually caused by preexisting skin disease, especially psoriasis, atopic dermatitis, severe seborrheic dermatitis, drug hypersensitivity to a variety of antibiotics, anticonvulsants, and anti-inflammatory agents, and underlying leukemia, lymphoma, or visceral malignancy. In some cases, a skin biopsy may be helpful to define or confirm a preexisting dermatologic disorder or underlying lymphoma, and therefore may be undertaken in all cases of unknown or uncertain cause. Although the cause of the exfoliation may not be found, it often times is found. Clues indicative of specific diseases may be found under close scrutiny, such as the nail pitting of psoriasis, or the localization of atopic dermatitis. A general medical workup is warranted, to help to determine the presence of possible underlying malignancy or infection, and the extent of any resultant metabolic derangement. A thorough history may reveal the use of a causative drug, such as penicillin, sulfa, isoniazid, phenytoin, or phenothiazines. Biopsy of involved skin may be performed, but may only yield nonspecific findings. 1. 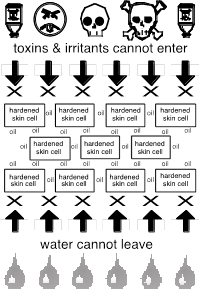 An Exit Barrier: The skin barrier maintains skin moisturization by preventing vital skin water from exiting the body i.e. evaporation of water away into the air. 2. 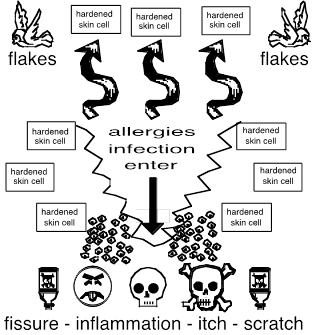 An Entrance Barrier: The skin barrier minimizes skin inflammation, microbial, and other foreign contaminants by preventing entrance of potential toxins, infectants, and allergens. A Damaged Skin Barrier Is Evident. Exfoliative dermatitis is a rather rare erythematous scaling skin eruption which involves all or nearly all of the cutaneous surface. 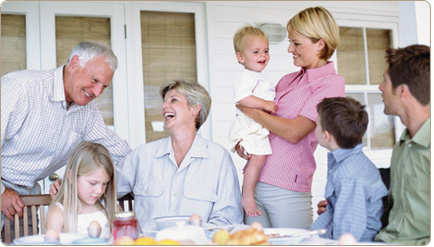 The condition may be a manifestation of any of a variety of underlying skin diseases. In patients under the age of forty, it may be due to atopic dermatitis, seborrheic dermatitis, staphylococcal scalded skin syndrome, or a hereditary icthyosis. The eruption evolves rapidly if it is due to allergy, lymphoma or leukemia (particularly in patients over forty), staphylococcal infection, or contact allergens; it has a more gradual onset if there is a primary skin disease which has spread, such as atopic dermatitis or psoriasis. Often the etiologic diagnosis cannot be determined. Varying degrees of erythema and scaling are seen which can range from fine, granular, generalized scales to large, erythematous, lichenified plaques. Generalized lymphadenopathy may be seen, as well as hair and nail involvement which frequently leads to the loss of both. Itching tends to be generalized and extreme, and metabolic problems may result from disruption of the barrier function of and increased blood flow to the skin. Much water and heat may be lost through the affected skin, which may result in dehydration, weakness, chills and fever, and hypothermia. There may be considerable protein loss. What Does The Skin Barrier Do? The skin barrier is a special skin structure that keeps vital fluids inside your body, and prevents unwanted toxins, infections, and allergens from entering. The skin barrier covers the entire body: You stay moisturized, free of inflammation, and free of infection. Sometimes atopic dermatitis, psoriasis, chronic eczema, and other inflammatory skin conditions grow out of control. When nothing has helped and the itch goes on and on, tiny fissures deepen further within skin lines, inflammation develops, leading to the medical condition called: Exfoliative erythroderma. Dirty fingernails can scratch and cut your dry skin to shreds causing staph infection, bleeding, more inflammation, and further skin barrier damage. When it is all said and done exfoliative erythroderma ends up as an itchy dried cut-up scaled allergic scratched inflamed cracked fissured infected bloody painful mess. Patients with exfoliative dermatitis may need hospitalization. A high protein diet should be initiated, because of the high degree of protein loss and high metabolic rate. A high protein diet will help offset the negative nitrogen balance induced by shedding layers of skin. Optimum skin care generally consists of continuous application of tap water wet dressings followed by continuous applications of an intermediate strength corticosteroid such as 0.1% triamcinolone ointment. Dressings can be made from either terry cloth towels or heavy mesh gauze and are to be changed and reapplied at 2 to 3 hour intervals. With clinical improvement, the dressings may be changed less frequently, provided that emollients are used also to help prevent dehydration of the skin between dressing changes. Aveeno baths can take the place of these tap water wet dressings. A lukewarm bath, perhaps with Aveeno added to the water to help soothe itching, can be very helpful and is recommended one or more times daily between dressing changes. Avoid allergic items in patients with exfoliative dermatitis. Exfoliative dermatitis involved skin can become itchy when exposed to allergic type substances such as perfumes, dyes, conditioners, powders, anti-perspirants, hair sprays, grasses, plants, fragranced products, shampoos, unrinsed laundry detergents, fabric softener sheets, dog or cat hairs, carpets, chemicals, Aloe Vera, PABA, detergents, acrylic nails, polishes, nickel, elastic, latex, etc. 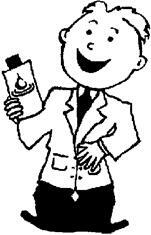 Hair conditioners can also induce itch! Please avoid all types of perfume on the patient and on people in close proximity. 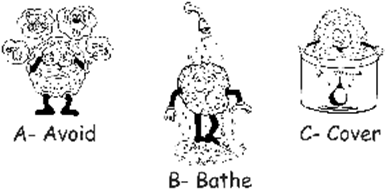 Persons with exfoliative dermatitis involved skin may bathe or shower twice daily: 1. 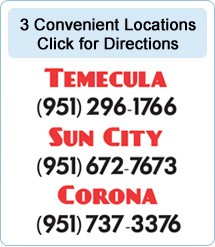 Use no soap on dry or sensitive skin areas. You may use mild Gentle Face and Body Cleanser, instead of soap. 2. After bathing, thoroughly lubricate your skin using Cream available OTC. 3. After your bath, you should not towel dry. Wipe off the water with your hands, then, apply a thick film of Cream to your entire body. This film will seal in your new moisture. 4. For shampoo, use OTC fragrance free Gentle Shampoo. Mild lubricants, or anti- pruritic creams, or mild hydrocortisone creams may be used all over the body to soothe the inflammation. Oral antihistamines may be used to reduce itching. Systemic steroids may be helpful, but not in every case, as they may aggravate psoriasis or Staphylococcal Scalded Skin Syndrome. Systemic antibiotics should be started in any case as a broken skin barrier opens the door to infections such as staph and strep. Antihistamines may be helpful in relieving pruritus (itching) and providing needed sedation. With improvement in the skin condition, the patient may be weaned off the steroids, antibiotics, and Aveeno baths. Gradually and eventually they may be discontinued, but only under the guidance of a physician. Most cases of exfoliative erythroderma represent an underlying skin barrier condition that has not been cared for properly, or has gone out of control. After the exfoliative dermatitis is resolved, the patient must be careful to again follow appropriate care for the particular underlying condition whether it is atopic dermatitis, psoriasis, or simple chronic eczema. 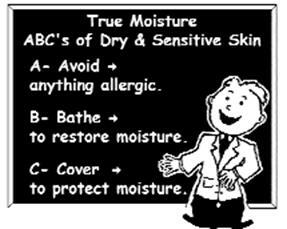 ABC moisturization is of the utmost importance as taught in the ABC booklet (you can download the ABC booklet off of our website). I suggest that you also read the “Skin Barrier Education” sheet also available on our website.